The next time you visit Maine when the wildflowers are in bloom, the phrase “stop and smell the flowers” may just take on a whole new meaning. Starting in early spring, the state comes alive with colorful flowers, from May’s tiny white-and-blue Quaker Ladies, purple-streaked painted trilliums and pink wood sorrel, to the splendor of the Maine lupine, the towering blue, purple, pink and white wildflowers that bloom along Maine’s country roads in mid- to late-June. Though hiking or strolling through the country is a wonderful way to experience Maine’s wildflower bounty, the state is also home to a range of gardens. Whether you’re visiting Downeast or the Maine Lakes and Mountains, set time aside to explore nature’s colors at Maine’s many botanical gardens. Set on a bluff towering over the Salmon Falls River, the Hamilton House – a National Historic Landmark – was built by shipping magnate Jonathon Hamilton in 1785. Today, visitors can tour this Colonial Revival estate and its magnificent, riverside perennial gardens. It’s open from June 1 through October 15 and is located in South Berwick. The Harvey Butler Memorial Rhododendron Sanctuary contains 30 acres of wet meadow and red maple swamp. Located near Springvale, this nature reserve is maintained by the New England Wildflower Society. It features 5.3 acres of rare great laurel rhododendrons — which bloom in July — plantings of native plants such as spicebush, painted trillium and clintonia, and almost 40 species of Maine wildflowers. Just outside downtown Ellsworth, the Woodlawn Museum, Gardens and Park encompasses a 180-acre estate. Created by Colonel John Black in 1824, Woodlawn’s landscape once served as a family farm. Today, the colors and fragrances of the garden reflect its later use as a summer home, with features such as a 1903 formal garden, complete with clipped lilac hedges, and cutting gardens. The house and gardens are open from May through October and the public park is open year-round. 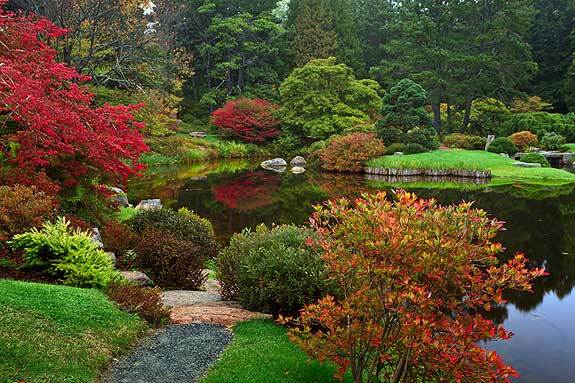 The Asticou Azalea Garden in Mount Desert Island is open year-round. Spring visitors can enjoy the cherry blossoms, while May through June brings the azalea and rhododendron flowers. Through July and August, the smoke bush, Japanese iris and water lilies bloom, while fall is accented by shades of red and gold. The garden was designed by Charles K. Savage in 1956. Charles K. Savage also designed the nearby Thuya Garden and Lodge in 1956. Set in a former orchard, the garden overlooks Northeast Harbor and melds a semi-formal English style with the raw beauty of Maine’s indigenous plants. The garden is open year-round. Its 140 acres contain a mix of annuals and perennials and a reflecting pond. Set inside Acadia National Park, the Wild Gardens of Acadia distill Mount Desert Island’s 12 distinct natural habitats into a single fascinating acre. From mixed woods to seaside, brookside to heath, coniferous woods to bog, this National Park Service-maintained garden is open year-round. Visitors can explore the plant-lined paths that flow along a peaceful stream. Located near Mount Desert Island’s Southwest Harbor, the Charlotte Rhoades Park and Butterfly Garden allows visitors to explore a coastal butterfly habitat. The garden was designed in 1998 by Bar Harbor architect Bruce Riddell. The garden’s beds, which resemble butterfly wings, feature a variety of perennials and annuals, all carefully selected to attract Monarch butterflies. It’s open from mid-April to mid-October. The Abby Aldrich Rockefeller Garden in Seal Harbor is open to a limited number of visitors just one day each week from late July through September. This private garden was built in the 1920s and designed by Beatrix Farrand. It fuses Western and Eastern landscaping for a dramatic display of summer color. Set in a historic 1775 home built for Captain George Tate of the British Royal Navy, the Tate House Museum is Portland area’s only pre-Revolutionary War home. Its gardens and grounds are maintained in their original style; visitors can take garden tours, offered once per month during the summer, and learn about Mary Tate’s herb garden, where the home’s former mistress grew plants for culinary, medicinal and aromatic uses. South Paris’ McLaughlin Gardens were first planted in 1936. Bernard McLaughlin, also known as the “Dean of Maine Gardeners,” created a horticulturalist’s oasis on this 100-year-old Maine homestead. Today, this 2-acre garden is open daily from May through October and contains an impressive collection of Maine wildflowers, perennials, ferns and more than 200 fragrant lilacs. In the heart of downtown Camden, the stunning grounds of Camden Harbor Park were gifted to the public library in 1931 by local philanthropist Mary Louise Curtis Bok Zimbalist. Designed by landscape architect Fletcher Steele, the gardens surround a public amphitheater and feature a careful blend of Neoclassical, Art Dec0-French Moderne, and Renaissance Italian styles with the natural beauty of Maine’s indigenous plants. It’s listed on the National Register of Historic Places. Boothbay’s Coastal Maine Botanical Gardens encompass 250 acres known as the “Miracle in Maine.” Open year-round, the garden opened in 2007 and was designed by landscape architects Bruce John Riddell, Herb Schaal and Terrence J. DeWan. The garden features several distinct areas, including rhododendron, meditation, hillside, tidal, pine, children’s and central gardens. It’s one of the only coastal botanical gardens in the country. The Avena Botanicals Medicinal Herb Garden in Rockport encompasses 3 acres of certified organic and biodynamic plantings, containing more than 150 species of medicinal herbs, flowers, trees and shrubs. Though it’s a working garden and nursery, visitors can stroll along the quiet paths or rest for awhile on one of the garden’s benches from spring through fall. Camden’s Merryspring Nature Center is open to the public year-round. This privately owned, non-profit park encompasses 66 acres and features an education center, trails and gardens. It’s also home to the Kitty Todd Arboretum, created from a former clear-cut, a Hexagon and Rose Garden, and a large Perennial Border. The center was founded in 1974 by Maine horticulturalist Mary Ellen Ross. The Robert P. Tristram Coffin Wild Flower Reservation encompasses 177 acres of Merrymeeting Bay near Woolwich. With hills, forest, streams, tidal marsh and sandy beach, this New England Wild Flower Society-owned reserve contains a diversity of species and habitats. Visitors can seek the more-than 100 wildflowers that grow here, including yellow violets and white baneberries, and stroll through the hemlock stands. It’s open year-round. The Viles Arboretum in Augusta is open year-round and features 24 collections of plants and trees, all crisscrossed by trails perfect for strolling or, in winter, cross-country skiing. From native plants to lilacs, hostas to American chestnuts, these collections encompass 224 acres of former farmland. The area was developed as an arboretum in the early 1980s. Encompassing 40 acres along the Kennebec River near Vassalboro, the Annie Sturgis Sanctuary is known for its diverse collection of alkaline-loving plants, including a large stand of rare wild ginger. This reserve is also home to wildflowers, such as purple trillium, bloodroot and trout lilies. It’s maintained by the New England Wild Flower Society. Set on 88 acres of land near Hermon, the Ecotat Gardens and Arboretum features 60 gardens and the Bangor Nature Club’s Mary Blethen Memorial Library. With more than 1500 perennial species, 280 types of trees and a diverse variety of wildlife, this garden’s trail system offers year-round color and beauty, from tulips in spring to fall-foliage hikes to cross-county skiing excursions through the trees. The 264-acre Mount Hope Cemetery in Bangor is listed on the National Register of Historic Places and is the second-oldest garden cemetery in the country. Established in 1836 as part of the rural cemetery movement, which sought to beautify these final resting places – this riverside space was designed by local architect Charles G. Bryant. Whether you prefer perennials or annuals, Neo-Classical or English country gardens, or simply enjoy strolling through a profusion of wildflowers in bloom, Maine’s many botanical gardens provide the backdrop.